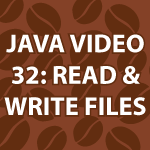 In this part of my Java Video Tutorial, I completely cover how to both write to and read character streams from files. I explain all of the following: PrintWriter, BufferedWriter, FileWriter, BufferedReader, FileReader, common file exceptions and much more. All of the code follows the video. It is heavily commented and will help you build your Java code repository while helping you to learn Java better. hi bro im unable to understand about proper use of html param and span tag, can u help me? A span is like a div, but it doesn’t force a line break to occur after it. While divs normally surround large pieces of information, a span normally surrounds a small line. param is used to set a value to a param / field / variable that is used by an object like videos, audio clips, Flash, etc. Objects are normally handled by a plugin in the browser. with these tools of calculating dynamic data, add, division ect.. and the golbal sum of a selectedRows..
you gave me the power to be the king of that day, i hope it wont be unbearable kingdom. please, also do some tutorial on how to use xml in java, and java networking, rmi and corba. and if possible, make one video for how to use html in core java..
please add more an more, and please cover android also, it’s on boom right now..
the game seems something very interesting, anyways if it is easily possible for you, do this as an illustration process. also i just want to know one more thing, as you said about “toddler game”, it’s a kind of game which can be played online, isn’t it?? i mean, we just attach that game with our site, and anyone can play that game, something like this?? By toddler game I mean for young children. I have noticed many flaws in games and I’ve been working on a came that will help children learn everything they need to know. It is a great learning aid because each part of the app will focus on different techniques any app would require. I’ll start making it as soon as I get time. It will be a major undertaking. and also please do some tutorials for nio.. Absolutely you could do that. You would just pull data from a database just like wordpress does. You could also just have static pages instead of single.php. I never made a full forum here because they are kind of hard to manage security wise. I guess I could create a phpBB forum? If you think people would like that I’ll do it. and if possible, please let me know, any source for this, any book or anything, can i refer, until you start?? Hi Derek.First a got to say awesome tutorials. Second i have a problem with the printWriter i think i cant write to a file, the source code is bellow. It puts out no errors but the file is blank. Thanks in advance for the help. P.S The names of the variables and methods are in Macedonian, sorry if it is an added difficulty !!! Found it. i didn’t close the print writer so it couldn’t it finish writing!!! Thanks so much for your effort..
Again thanks so much for your work!!! Thanks a lot for your efforts!!! Hello, Is there a way through which, we can create our own video module in java? were we can chat through video from 1 system to another? Hello, is there a code where we can do video chat through java from 1 system to another? You are a good teacher. Here is my question. Why define as ‘private’ the class Customer and its variables ‘public’? Thank you 🙂 The answer to the question is because I wanted to focus on PrintWriter, BufferedWriter, FileWriter, etc. in this tutorial. You are correct that it is important to encapsulate your code. When I’m making a tutorial though some times I need to make a judgement call on whether encapsulation and the extra methods required to use it will get in the way of what I’m focusing on. I trust that people that have no idea what encapsulation is won’t miss it and that those that do know will understand that when I make these videos I focus on topics rather then optimized code. You explained me, why to use static keyword for Monsterboard data memeber within a class, reason is, action is not getting attributed to that data member. and also you are placing non-static members within this class. Am bit confused on this. The values for static variables are shared by every object of a certain class. If the value changes for one so does it change for the rest. You only use them when you need that capability. Does that help? oh i got u, objects of javalesson26 class can use same customer object that is created in getcustomers() method, make sense. It is taking time for me to digest OOPS. Assembly lang is more easy for me . It takes everyone a while to figure out OOP. My object oriented design tutorial may help you see the thought process. How System.out.println() is able to print any kind of object? How does println() method know the structure & type of data under custInfo? Each object has a toString method that determines the output when you print an object. You can override it if you need. however the bufferedReader is not as it comes in the loop ! I am unable to figure out that why it is not finding null for the while loop ..
sorry .. my bad .. i figured out the problem ! Hello Derek, i have one doubt in this video. Why is that you create methods like createFile as private and yet static, also why do you do similarly for class Customer? I mean can you please tell what are the benefits of doing so and which cases we shall do so ? I defined Customer as a private static inner class because it doesn’t need access to the members of the outer class. It is private because no other classes should access it. It is a utility class and I don’t want it to be used for any other purpose. First thanks a lot again for your awesome tutorials. one is to load a file from hard disk that is straight forward. The other is to load the file from web. Could you explain what I need to be able to do this? I have used your tutorial for parsing XML files, but there you parse a file. How can I parse this stream? How can xmlDoc be loaded by that url.openStream instead of a file ? I have a bunch of tutorials on parsing xml with Java. Look here at around line 187. After some experiementation(and few research on the web) i understand correctly the IO. But there is something i don’t get : how to add a new line in a file. All the String that get into my file end on the same line. For some reasons there is intrinsic “\n” in those lines. I want to be able to see them, to make the file look clear, not just a clump of characters. I saw BufferedWriter.newLine() ( Here) could add a new lines, i just get how to do it. I can’t make it work for me. Can you please help me?